The harbor of Kusadasi is large, several cruise ships are docked on our pier. We exit the ship via the gangplank into a mist of warm morning air and follow the mob of people into the customs building for the cursory review of credentials needed to enter Turkey. The customs building is large with duty free shops and I make a note to pick up a couple liters of Bell’s Scotch on the way back. The local officials are geared up to handle the large crowds. We breeze through the procedure and emerge into a parking lot full of buses. Our tour bus is easily found and the guide patiently waits at the bus door. We hand her our passes and step up into the plush air conditioned coach, a brief head count and we are on our way. The landscape is dry but not barren, trees and groves of trees are scattered about. There are large flat areas with plowed furrows. The guide explains that the harbor extended several miles inland during the classical period and we are driving across the ancient ocean floor. This is the same as Pompeii, which was a sea port in Roman times but is now seven miles or so inland. The climate was warmer in the ancient world; the ice cap was smaller and the seas were higher. We continue on the bus. Soon hills rise around us and small mountains appear in the distance. The drive seems short, an hour or so and we are filing off the bus in front of the ancient site. The guides tells us Ephesus was populated since Neolithic times, but did not become an Ionian city until the tenth century when it was settled by Athenian colonists. During the wars between Greece and Persia the city was an ally of Athens and became part of the Delian League. 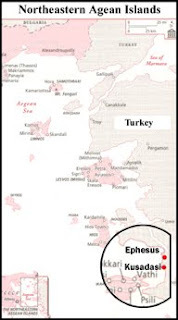 Because of its proximity to Perisa, Ephesus fell under Persian influence. When Alexander the Great conquered Persia, he was welcomed as a liberator in Ephesus and treated like a god. The guide continues , but my mind reels. We will be walking down the same streets trod by Alexander the Great. She goes on to say that Anthony and Cleopatra made a stop here and that St. Paul and St. John lived in Ephesus. Then she offers a "side trip" to the home of the Virgin Mary. I am not an academic, but I have always had a strong interest in ancient history. How did the significance of this wondrous metropolis escaped me? 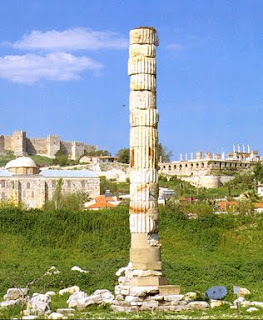 In the ancient world Ephesus was known for a huge temple dedicated to the mother goddess, Artemis. It was considered one of the Seven Wonders of Ancient World. The worship of the mother figure, Artemis, may go way back to the Neolithic era. The goddess was probably renamed Artemis by the Ionian Greeks that colonized the area. Sadly, today there is nothing left of the temple save one solitary column standing stoically in a grassy field.The original temple was wood and burned down just prior to Alexander's arrival. A new stone temple was under construction when he arrived in about 334 BCE. The stone structure was destroyed by Goths in 263 AD. With the popularity of Christianity growing, the temple was never reconstructed after that. In its glory it had a base of 625ft x 220ft, was 60ft tall, and was supported by 120 giant columns. The new temple was in use for nearly six hundred years. 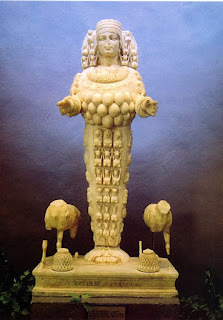 The famous figure of Artemis that was found is shown above. Some say the bulbs on her chest are breasts; others see them as eggs, or even bull testicles. She was considered the mother goddess responsible for fertility, bountiful harvests and plentiful hunting. Those are her hunting hounds at her feet. Next; Walking the streets as Alexander and Anthony did. whrusseth.blogspot.com is very informative. The article is very professionally written. I enjoy reading whrusseth.blogspot.com every day.